You can tell there’s something wrong when the opening of a single hydrogen station still makes the news. 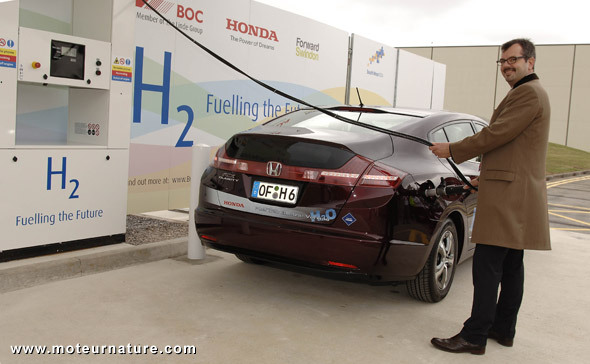 We’d wish to get the announcement of hundreds of hydrogen stations opening in every country. But we’ve been waiting for several years, and nothing bigger than the opening of single stations came. We keep on waiting for more, but let’s be happy: a new station’s opening in the UK. It comes from a partnership between Honda, the manufacturer of the FCX Clarity sedan, and industrial gases company BOC, a member of The Linde Group. The station will be inside Honda’s premises at Swindon, where the Japanese company owns a large plant. But it’s not intended for Honda’s private use. It will be open to the public, though there shouldn’t be many customers as last reports from Swindon said there were few hydrogen cars driving around. Hydrogen is available at both 5,000 and 10,000 psi pressures, with on-site storage so that several vehicles can get a fill-up back to back, just like gas cars do normally at gas stations. Actually, filling-up an hydrogen car is no different than a car running on gasoline. The whole thing takes less than 5 minutes in an Honda FCX Clarity (pictured above). The only difference is outside the station, on the road. On an hydrogen car, nothing but some water vapor comes out of the exhaust.